The Trials and Triumphs of Candi Staton Ed Gordon talks with gospel and soul singer Candi Staton about her music career, and overcoming alcohol and domestic abuse. She has a new album, His Hands. Ed Gordon talks with gospel and soul singer Candi Staton about her music career, and overcoming alcohol and domestic abuse. She has a new album, His Hands. Early in the program, we talked about black American struggles with alcohol abuse. One woman who knows that fight all too well is singer Candi Staton. She struggled with alcoholism throughout her career, even as her professional life soared. As a teenager, the Alabama native toured the gospel circuit with Mahalia Jackson. In the mid 1970s, she went from recording R&B style country tunes to making disco hits like the classic, Young Hearts Run Free. Despite all of Staton's musical success, by the early 80s she was descending deep into alcoholism. She also endured repeated spousal abuse. That's behind her now. And she sings about her trials and her triumphs on her latest disc, His Hands. I recently sat down with Staton. She recalled how her childhood experience led to some pain in her adult life. 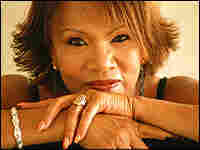 Ms. CANDI STATON (Musician): I had poor self esteem and when I would get in front of an audience, I would get so nervous. That started the alcohol. It made me feel comfortable and I brought people in my life that wasn't really in my corner. GORDON: In fact, your father was an alcoholic. Ms. STATON: Yeah, my dad used to come in drunk and he was abusive to my mom. And I guess that was what I was looking for, Ed. In every relationship, I guess I was searching for my father; and I often say, Ed, I married the same man four times. GORDON: Mm-hmm. Here's what else is interesting when you read about Candi Staton, and that is the raw emotion that's brought to the microphone when you perform. How much of that was internalized what you were living at any given time? Ms. STATON: That was the way I could express myself. It was therapy for me, and when I get to that microphone and I grab a song that would express how I felt; I could bring it home because that's exactly how I was feeling. Ms. STATON: (Singing) "I know my man's been givin' some love away. Ms. STATON: (Singing) But how much love do you think I can lose in one day? Unidentified Woman: (Singing) Lose in one day. Ms. STATON: (Singing) I don't feel like--ooh, ooh--my man been doing me wrong though, just as long as he takes care of home. GORDON: Not everyone is blessed with a signature song. You are. GORDON: Young Hearts Run Free, your biggest hit; yet, it is not necessarily reflective of who you are in terms of the artist that Candi Staton is most of the time. GORDON: Does that bother you or do you just appreciate that you have a signature song? Ms. STATON: …because I was going through one of these devastating--trying to get out of a marriage that, you know--I mean, this guy was physically and mentally abusive. And David Crawford wrote the song, and I would go to David and I would say, David, this is going on and this is happening to me. Then he would say, I'm writing you a song that's gonna last forever. Ms. STATON: (Singing) I say I'm gonna leave a hundred times a day. It's easier said than done when you just can't break away. Unidentified Woman: (Singing) Can't break away. Ms. STATON: Young hearts run free and never be hung up, hung up like my man and me. Ms. STATON: At that time, I was basically doing chitlin' circuit gigs. People would heckle you while you're singing, you know? I didn't come pay my $5 to see this. I want to hear Stand By Your Man, you know? So I had to go through all that kind of stuff. And when Young Hearts Run Free came, it put me into another level. I was getting into the small concert halls. I was on big shows with Teddy Pendergrass and all these people. So it took me out of the chitlin' circuit and I was thankful for that. GORDON: …had started really doing gospel music. So, why the return to this? Ms. STATON: I was so messed up when I first gave Christ my life. And I got into the church in 1982. I started writing gospel songs and I was happy. I had got my own TV show with Trinity Broadcasting and there was a pastor about five years ago that took me to the side. He said, you know those songs you used to do? All those songs, he said, those weren't bad songs. They fed your family, they bought your cars. That's not a curse, that's a blessing. Ms. STATON: So I began to ponder over that stuff. I said, you know, he's right. These are songs, and Stevie Wonder put it so well, in the key of life. And I don't think there's nothing wrong with it. GORDON: Talk to me about the title track real quick. Ms. STATON: His Hands, this song was written by Will Odem(ph). He used to watch my television show on Trinity Broadcasting and I'm very open and I'm real, you know? And Will used to watch the program, and when he heard that I was getting ready to do a new album, a new secular album, he said, well, I got a song for her that I wrote about her. And I listened to it and I fell in love with it. But it's actually from a man's point of view. What it feels like to be abused by a man and it's from the hands of an abused man into the hands of God. GORDON: …this is it right here. I mean, this is a true one through eleven; there are 11 songs on it and you get all of that from Candi Staton. The CD is called His Hands and Candi Staton, it was a pleasure talking to you. Ms. STATON: It's wonderful talking with you. Ms. STATON: (Singing) I will pity that, I will pity that beautiful man. And, Lord, I will bless the path. We were both just wounded children, ooh, in a love, thank God it didn't last. There's a lot of things, Lord, in your touch(ph), sometimes just slightly twisted, move me so much. GORDON: That's our program for today. Thanks for joining us. To listen to the show, visit NPR.org.